How we are responsible and how we can effect change. The world is a vampire. Exploitation of natural resources are on a very unsustainable scale as we are taking from our planet but fail to invest in it. There is no such thing as a free lunch and this is reflected in the devastation Earth has been facing from our actions. Human kind is oddly different in comparison to everything else except it. Our conscious thought has enabled greed to breed in us, making us seemingly unfit to live sustainably from the planet’s life. It’s the conscience, however, that allows us to change who we are, good over bad creates the need to save our paradise. We must band together to fix our destruction, educating ourselves and spreading our love to other lifeforms. Like minded people create resilience in the face of adversity. Tropical Research And Conservation Centre (TRACC) in Sabah, Malaysia is one of many homes for these people. TRACC does everything and anything it can for the environment around it. TRACC does not invest but rather unconditionally gives. It creates a sense of belonging for people wanting to erase their carbon footprint and that of their fellow peers. Situated on Pom Pom Island, surrounded by the entire ocean, our workplace is also our paradise, and our work shows the hope we hold that Mother Nature won’t be destroyed, but rather saved by humanity. Seamlessly time passes with each dawn and dusk making each day a contribution to the environment. Attending to global issues on a local scale such as turtle conservation, coral reef restoration, reef health monitoring and Crown-of-Thorns (CoTs) infestation are just a few to name from in the endless effort we place on our shoulders. I would like to provide you with a detail discussion on one that has been a main focus at TRACC this year, CoTs Management Program. It all started with a leisure dive to end the day well on January 2018 where an infestation of CoTs was observed on the northern tip of Pom Pom Island. Bear in mind, this island has been obliterated by blast fishing decades ago where the healthy coral cover now ranges in between 10-30% even at the best sites. Hence, we affirmatively made efforts to begin controlling the infestation by removing them from the reefs and burying them ashore. The maximum number removed on a single dive by a five-person dive team was 85 CoTs. In the following month, we realised the need to establish the outbreak magnitude to understand the population demographics and dynamics. This was done simply by conducting a survey using the underwater belt transect with an area of 100 square meters. The results proved active outbreaks on all five sites surveyed for CoTs on the island’s reef. Little did we know back then, the infestation was much worse than we could ever imagine. We started to look at neighbouring islands and reefs for the similar problem, specifically Kalapuan and Baturua. These reefs have been heavily exploited up until today as it is the main source of income for local Bajau Laut communities in the surrounding area. However, the areas are not commonly dived sites used by tourism, and are not within the state’s marine parks, meaning it has little exposure. Since we work closely with the local community in the area, we explore the reefs with them to identify infestation hotspots. That was when we had a shocking discovery of CoTs infestation that surpassed the outbreak threshold by a milestone. 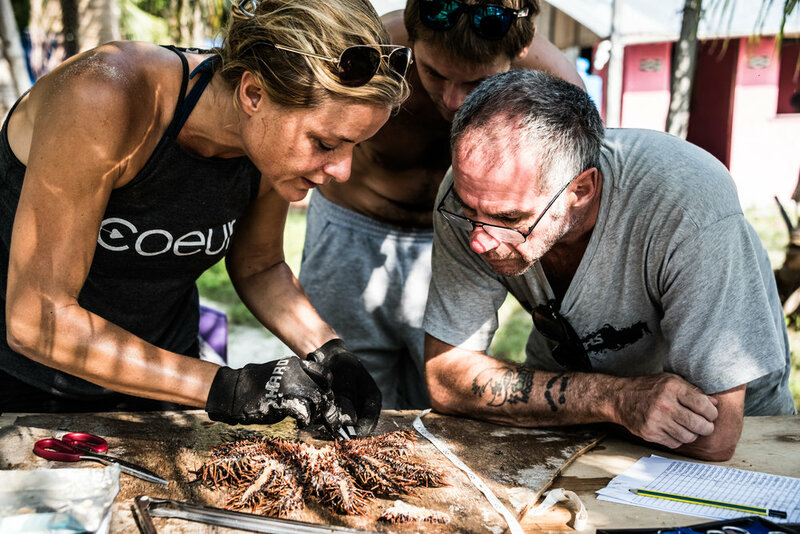 Upon establishing that the spot outbreaks have passed the outbreak threshold on all sites, we began to physically remove them from the reefs we visited, whilst recording data for our long-term study. This includes the Catch Per Unit Effort (CPUE) where the number of divers for a given time were recorded to the number of CoTs removed. CPUE enables a relative comparison between islands and reefs, interestingly it showed the outbreak magnitude at Baturua is three-folds higher when compared to the Great Barrier Reef (GBR). 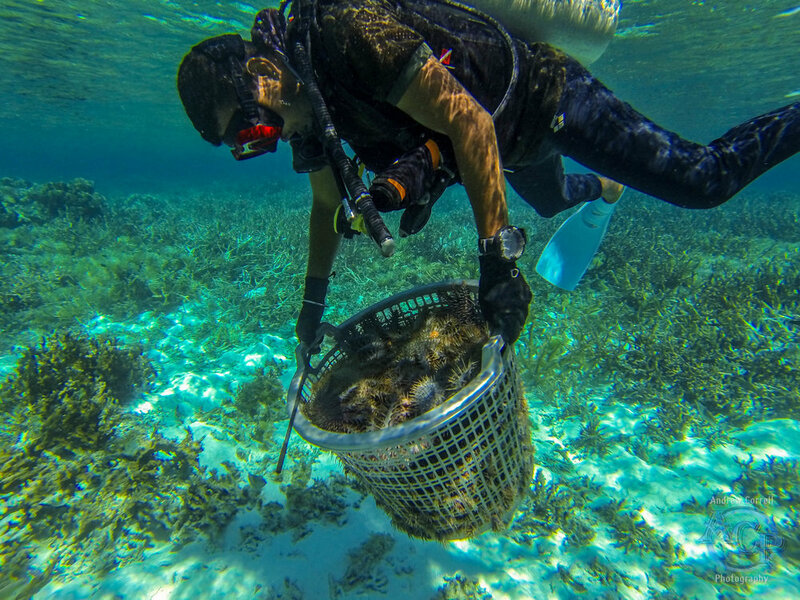 A management program to tackle the outbreaks is essential especially when infestations such as this can further destroy an already damaged reef as observed very recently in a neighboring reef, Kapikan. What could be the cause of these outbreaks? That is a dire question scientists are asking themselves. There are two hypothesis namely the nutrient hypothesis and predator removal hypothesis. It is more than clear that these sites are facing both threats combined where the reefs have been overfished and local communities have no waste disposal systems. 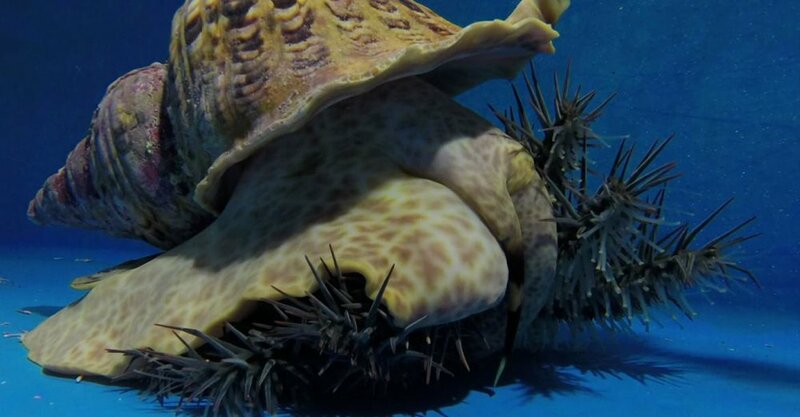 Reduction in predators like triggerfish, triton snail, humphead wrasse, could be an explanation to cyclic outbreaks where without natural predators CoTs can infest without a natural biological control. On the other hand, influx in nutrients in adjacent bodies of water provides for algal blooms, which means the survivability of larval CoTs is greatly improved. This would be catastrophic as a mature female CoTs can release more than 10 million eggs into the water column at once. That being said, an effective removal effort is needed to curb the infestation once and for all. For the past six months, TRACC has been working tirelessly to study CoTs to provide for a better and more effective removal strategy. To achieve this, the gonad to body ratio of CoTs are being recorded to form a long-term trend on the reproductive cycle. 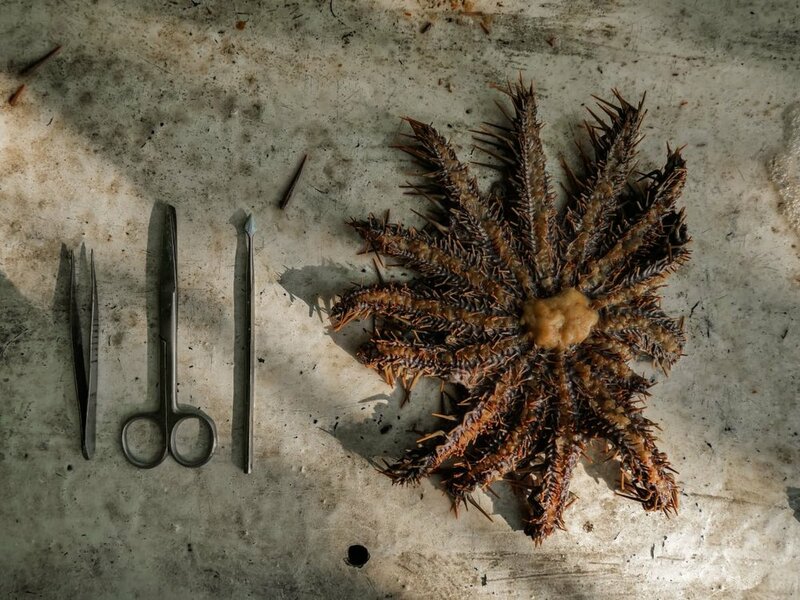 The ratio can be determined by weighing the gonads and body of the CoTs where the presence of higher percent of gonads would show it is more fertile. This information allows for coordinated efforts throughout the region to remove CoTs before their reproductive peak. People from across the globe with various backgrounds come to this place making it happen through citizen science. This further builds to the understanding of the infestation dynamics and demographics as per the objective of the management program. 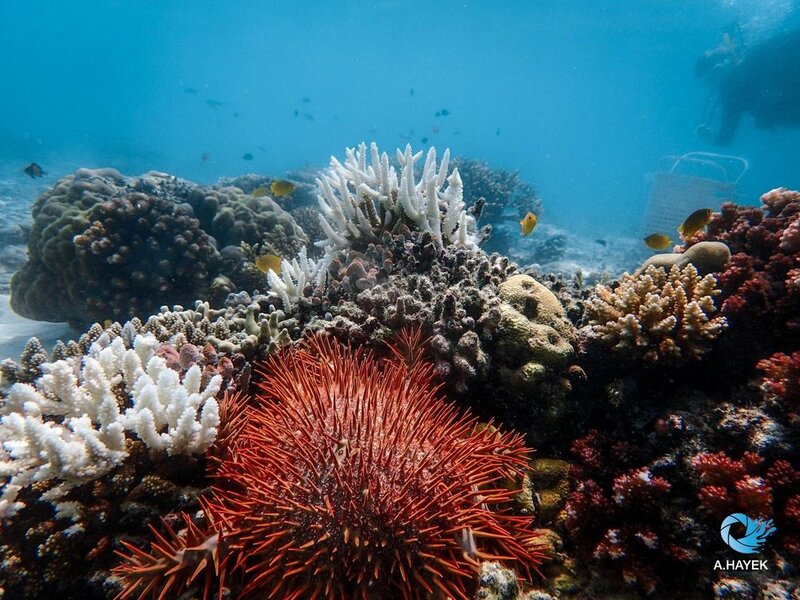 CoTs are definitely not the creatures they’ve been made out to be, as they play a vital role in keeping the balance of the coral reef ecosystem. This is achieved by them feeding on dominant and faster growing corals allowing space for the less dominant and slower growing corals to compete. They essentially promote the vital diversity of coral reefs. However during outbreaks, they tend to feed on multiple coral types including the slow growing and less dominant ones. How Do You Know There’s An Outbreak? Based on existing literatures, an outbreak can be classified when there are more than 40 CoTs per hectare of reef. These areas of spot outbreaks are undoubtedly facing a huge destruction based on the threshold. A single CoTs can feed a minimum estimate of 6 square meters of coral cover a year and 365 CoTs can feed on that area in a single day. On most sites of the management program, we have removed a rough estimate of 200-300 CoTs in two dives with just five experienced divers on the team. This year alone, we have removed a total of 12,000 CoTs. This number could feed on around 180 square meters of coral every single day, which means we indirectly protect 18x10 meters of coral from permanent mortality in reefs that are already facing huge anthropocegenic threats every day. Knowing this, we are driven with high spirits to control such outbreaks while conducting researches to provide a clearer understanding on the population. We foresee that through this program with the help of volunteers at TRACC, we can achieve The removal of CoTs on sites that have surpassed the outbreak threshold on a long-term scale. This would directly lessen the coral mortality in those areas and preventing large numbers of CoTs to affect adjacent reefs. Pom Pom Island, is an evident observation that direct removal efforts can help in reducing the numbers of CoTs over a matter of time. Any CoTs Buster would tell you they’ve seen this with their own eyes. We have been in close contact with Sabah Parks for collaborations to manage the outbreaks as we understand the need for a regional effort to protect our reefs. This research would shed light on the dynamics of CoTs population where regional environment bodies can then strategize their removal efforts for maximum effectiveness. There are so many aspects to CoTs and we ,on a little island, are taking baby steps in order to answer questions that can help save the reefs of the Indo Pacific and beyond. Shimah Kills You, I mean It.